PARIS (AP) — French President Francois Hollande on Friday vigorously denounced suggestions by the conservative presidential hopeful that he is trying to discredit political rivals behind the scenes by using dirty tricks. The clash between the Socialist Hollande and right-wing Francois Fillon threatens to further stain the French presidential campaign, already colored by a stream of corruption scandals and voter frustration with the political establishment. It has also drawn comparisons to President Donald Trump’s accusations of wiretapping by predecessor Barack Obama, and Trump’s attacks on the U.S. judicial system. Fillon, whose presidential bid is flailing because of a , told France-2 television Thursday night that he wants an investigation into suggestions in an upcoming book that Hollande intervenes in legal cases for political reasons. “I am going to accuse the president of the republic,” Fillon said. “If we are looking for a cabinet noir, we found the cabinet noir,” referring to an alleged secret bureau tasked with damaging political rivals. “Tonight, I solemnly ask that there is an investigation opened on the allegations raised in this book because this is a scandal of state,” he continued. Hollande, who is not seeking re-election, responded in a statement saying he “condemns these false allegations with the greatest firmness.” He insisted he had never intervened in any judicial procedure, including the recent investigation into accusations that Fillon employed family members for parliamentary jobs they never performed. “There is a dignity, a responsibility that needs to be respected. 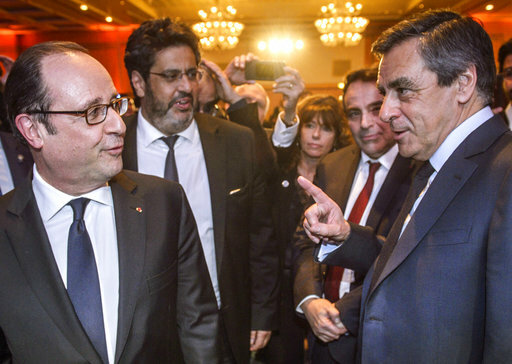 I think that Mr. Fillon is beyond that,” Hollande told France-Bleu radio Friday. The book, “Bienvenue Place Beauvau,” asserts that Hollande profited from a network of allies in intelligence and financial agencies and a “complex mechanism to orchestrate judicial affairs” targeting prominent conservatives. However, its authors say that Fillon oversimplified their findings — and the book itself says “it is impossible to provide formal proof” of such a secret bureau. Hollande’s predecessor, Nicolas Sarkozy, was accused of similar secret interference in legal cases for political ends. Fillon, prime minister during Sarkozy’s presidency, was once the front-runner in the race for France’s two-round election April 23 and May 7, but has seen his popularity sink since the jobs investigation opened. Fillon denies wrongdoing and says the case against him is a smear campaign by rivals. “When I see that it took only two hours to open an investigation of my wife’s job, then I think that it would only take a few days to open an investigation about a book that harshly accuses the head of state,” he said Thursday. Voters appear fed up with both Fillon’s conservative and Hollande’s Socialists. For the first time in generations, neither party is likely to win the presidency this year.